Bring the symbol of strength and courage into your home with this gorgeous 9 Inch English Oak Tile. Fire Creek has several glazes to choose from to compliment any décor. Creating a backsplash, fireplace surround or bathroom tile installation will bring the serenity of a mountain stream to your home. For many the Oak Tree represents strength and courage. Others find the Oak reminds them of healing and health; a bearer of good luck. 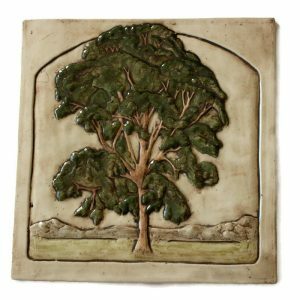 What ever meaning the mighty Oak has for you, this beautiful tile will remind you of its symbolism every day as the center piece to your tile installation. This beautiful hand crafted 9 inch piece will be gorgeous as a focal point to any room. Use it as the focal point above the stove, or a conversation piece in a fireplace surround. The antiqued, hand painted finish works well with tumbled travertine or other natural stone tiles. Each tile starts as a slab of clay, hand carved and cast in plaster. Take a moment to read our tile process HERE. We have several glazes for you to choose from in our shop. A variety of colors to match any tile installation and décor. Fire Creek can help you achieve the look of your dreams. We craft every tile just for you, so please allow 4-6 weeks delivery. Do you still have questions? You can find answers to our frequently asked questions HERE. You don’t have to have the same box store tiles that everyone else has. Be Bold, Be Brave, Be You! Choose tile that reflects your personality and has meaning to you. Get Fire Creek Tiles today! Rottweiler 4 Inch Ceramic Tile~A loyal Breed.